A scene from the Star Trek episode “Spock’s Brain,” which aired in 1968. When people critique a welfare state, what they’re usually objecting to is the notion that people deserve certain basic resources from the state regardless of how much they contribute. In the Star Trek universe, most basic resources on Earth are essentially unlimited and are therefore distributed free of any cost or trade. The Federation has enough clean sources of energy that it will never use it all up, and it can make food, water, clothing, etc. from energy. So people who don’t work and just live off the free goods being provided aren’t parasites because the resources they’re using don’t drain the state. They’re not taking it from anyone; it’s just free. This would sort of be like saying: Are American citizens who don’t pay for the air they use parasites? It’s also clear that there is still an economy of sorts on Earth and certain things are not free, although they are also not available for monetary purchase. Some things have to be limited in nature, so they can’t be available to everyone. This means that some kind of decision matrix must be applied regarding who gets them and who doesn’t, so that whatever qualities the eventual recipient has that resulted in them being awarded the good is essentially what they “paid” for the good. Let’s get a bit more concrete. As an example, Sisko’s father runs a restaurant. Seats at that restaurant have to be a finite resource (because they require labor), so they would not be “free” to everyone—the owners get to choose whom they give it to. (That brings up the interesting question of whether the Federation would have anti-discrimination laws, but I digress.) Let’s say Sisko chooses to feed people in his neighborhood; choosing to live in that neighborhood is the “price” his customers pay for his food. Similarly, Picard’s brother makes real wine; since that requires real grapes and, again, labor, that would also be a finite resource (as opposed to synthehol, which is free to everyone). From the context, it seems likely that Picard the elder distributes his bottles to friends and family; a relationship with him is therefore the “price” of a bottle. However, he would likely also distribute bottles in “reputation trade,” so if you run an outstanding French restaurant, Picard would like choose to supply you with bottles. In return, as a courtesy to a great vintner, the Picards can likely get a table at every great restaurant in France whenever they like. Art, live theater, music, etc.—anything involving human time, labor, or creativity would constitute limited resources. Presumably, if you wanted that kind of thing you could sign up to get it—if there was too much demand, there would have to be a waiting list. So in the Star Trek universe there are motivations to “make something of yourself”—you demonstrate that you are a worthwhile person, which would make others more inclined to befriend you (and thus give you the fruits of their labor) or jump you to the top of waiting lists for things like real wine, spots at a restaurant or a theater show, pieces of art, human-designed clothing, etc. It’s clear that Starfleet personnel are very high status and thus are cosseted in most places and given first access to things of this type; this would be a huge motivation for joining Starfleet. I also think that this would make a huge change in the culture of work and success as we think of it today. There would be much less labor required to keep society running, so expectations regarding working time and ethics would be very different. My guess is that an average workweek in the Star Trek universe would be around 10 hours a week. People would actually think that those who worked much more than that were strange and unhealthy and obsessive, similar to how we think of workaholics who work more than 60 hours in today’s world. Note how often Picard gets ragged on for working too hard and not taking vacations, despite that he clearly spends plenty of time on leisure activities like music, reading classic fiction, and amateur archeology. O’Brien on DS9 also gets ragged on by his co-workers and his wife for working too much, despite that at least a third of the time when we see him, he’s either at home with his family or in Quark’s having a pint and playing darts. When 10 hours a week is all that’s expected of you, it would be a lot easier and more fun to get motivated to do things like be a bartender, cook, security guard, etc., especially since by doing so, you would demonstrate to your fellow members of society that you’re not a lazy slug. People would likely be even more motivated to learn to do creative, artistic, and musical things for themselves, to design their own clothes from the replicator, to excel in fields like technological advancement and medicine and so on because they wouldn’t be able to buy it from others. So custom creative work would be available to more people than can afford it now, because a lot more people would have time to do it. Similarly, technical advancement would be faster because with all people having the time to be an amateur scientist if they’re so inclined the Federation would have a huge brain pool to draw from. This also, of course, gets into what exactly we consider working. Very few, if any, humans would choose to sit on a couch doing nothing all day, every day. Everyone would choose to do something, even if it’s something that today we don’t consider work. How do we measure if that something is work or leisure? If someone spends all his time watching TV and posting reviews and criticism of what he watches online, does he work for a living, or is he a lazy parasite? Well, in today’s world, we measure that by how successful he is. Someone who owns a blog with enough readers that he is able to sell ad space and make a living is an industrious, model American. Someone who owns a blog with few readers is a lazy parasite. Yet there is little to no difference in how these two people live their lives or in the amount of work that they do. In the Star Trek universe, how much money one earns is removed as a measuring stick of success and worth. While the more popular blogger would no doubt still be seen as more successful, neither would be seen as a parasite; both would be valid life choices. So, to sum up: Yes, there are probably a few people on Earth who just live off a replicator and never work for a living, as we would consider it today. However, they’re not lazy parasites because they’re not draining anything from the state or from others; they’re using free energy. And my guess is that the vast majority of people probably do gain skills that they can use to contribute to society and elevate their status and self-worth. Star Trek: In StarTrek, when the crew of the USS Enterprise travels at the speed of light and comes back to Earth, why don’t they find people on Earth have aged more than them? Science Fiction: Can a person enter a wormhole? 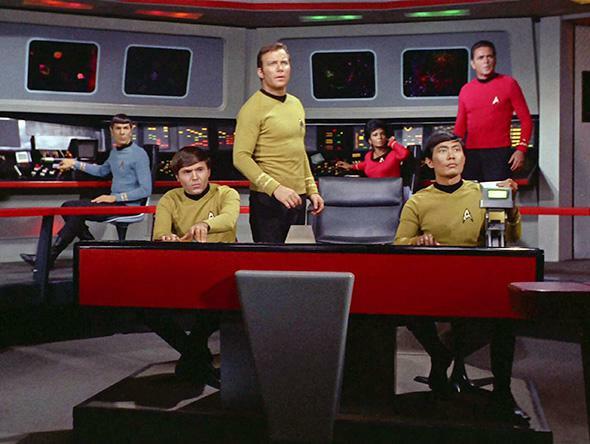 Star Trek: What are some cultural faux pas when working at Starfleet?